56 block logo dark gray 3-part picture on back. Die frühe Version des 3M Facts in Five Spieles war mir bis zum Februar 2000 noch nicht bekannt und ist bisher auch nicht im "3M-Games Catalog" enthalten. Außerdem gibt es von diesem Spiel einen Vorgänger, der bei der Firma "Advanced Ideas" ca 1965 erschienen ist. Das Spiel ist fast identisch zu der frühen 3M Version - sogar die Class Cards haben größtenteils den gleichen Inhalt ! - 50 Class Cards, 50 Buchstaben, 1x Winning Records, 1x Master Score Sheet, 6x Playgrid, 1 Regel. The game box cover has gold leaf lettering stamped on a solid black background. The letter pool is made of heavy duty vinyl tiles while the card deck is printed and cut from plain card stock paper. 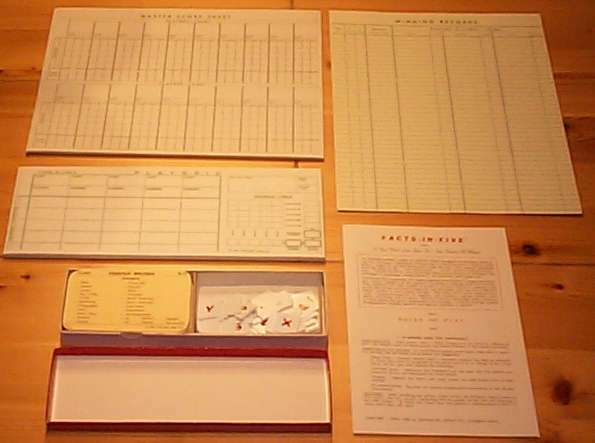 The original production copies of the games do not include a sand timer- at the time the thought was that some type of timepiece would always be available in a home party setting. One of the biggest problems facing a small company is packaging. How to make the product stand out, or at least compete, among a phantasmagoria of colors, designs, and images of other games on the store shelf. At the time, the cost of four color artistic design of the box cover was out of the question. The only solution was to get noticed by exception. We made the cover very plain and stark so that it stood out by its sheer plainness - dense black with a little touch of gold! 1964 - Article appears in THIS WEEK Sunday newspaper magazine supplement entitled "J.F.K. 's Favorite Word Game." 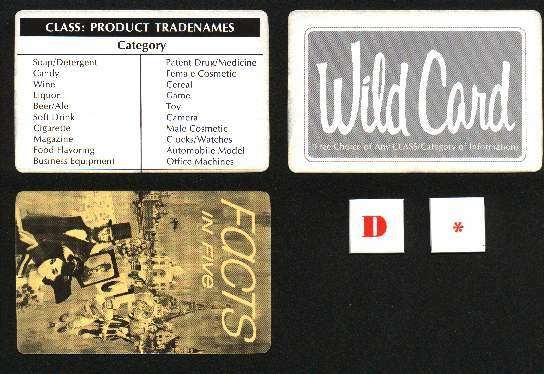 Using general ideas contained in the article, Richard A. Onanian invents Facts-in-Five and forms Advanced Ideas Co. (now Inc.) to produce and market 10,000 copies of the game. 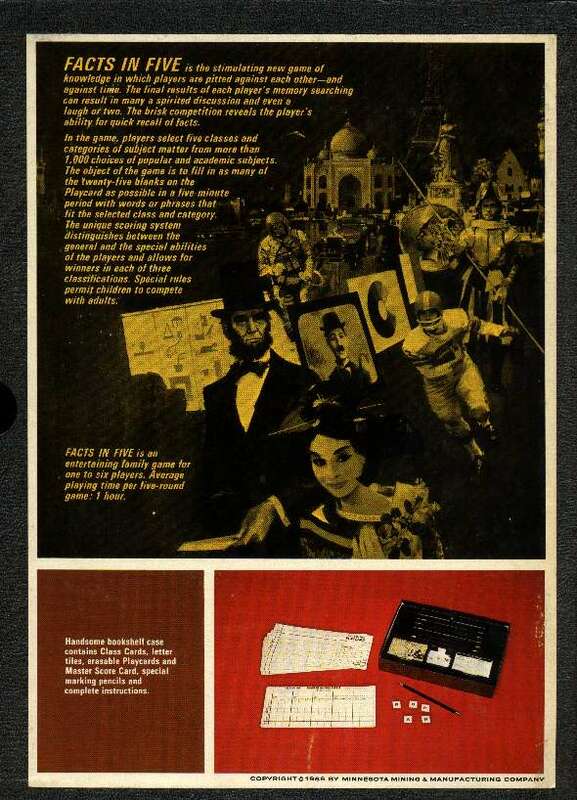 1967 - Game is licensed to 3M Co., who publishes game as part of their Bookshelf Game series. Advanced Ideas continues to sell game to deplete its inventory. 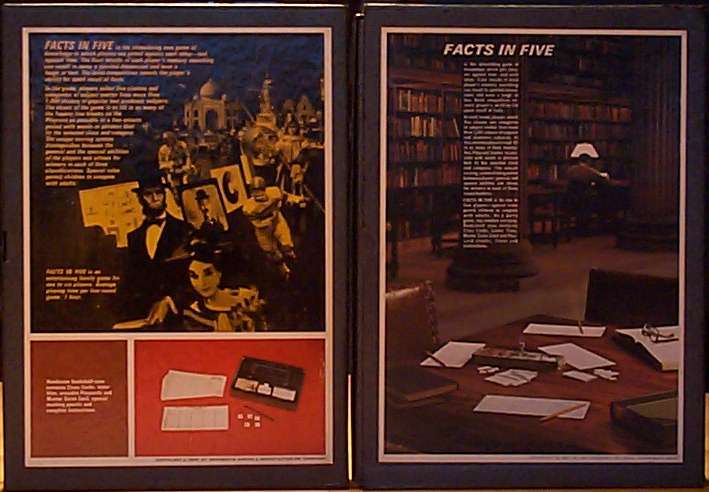 1976 - Facts-in-Five is licensed to Avalon Hill Game Co., pursuant to AH's purchase of 3M Company's game line. 1999 - All rights to the game reclaimed by Mr. Onanian at the time that Avalon Hill sold its game business to Hasbro, Inc.
2004 - Advanced Ideas, Inc. developing plans to have Facts-in-Five republished. 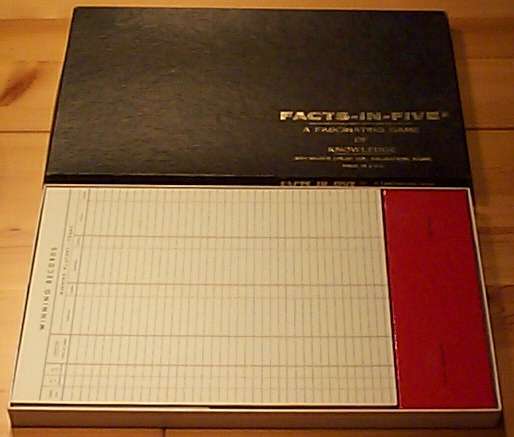 Diese Ausgabe von Facts In Five ist von 1966 und unterscheidet sich stark von den späteren Ausgaben: Es sind mehr Buchstaben enthalten, es ist keine Sanduhr vorhanden und Playcard/Master Score Card sind abwaschbare Tafeln ! Bild: Vergleich der frühen mit der Standardausgabe - links die #1. - 56 Buchstabenkärtchen ; Plastik, 2x2cm, rote Schrift auf weißem Hintergrund. 'Facts In Five is the stimulating new game of knowledge in which players are pitted against each other - and against time. The final results of each player´s memory searching can result in many a spirited discussion and even a laugh or two. The brisk competition reveals the player´s ability for quick recall of facts. I the game, players select five classes and categories of subject matter from more than 1.000 choices of popular and academic subjects. The object of the game is to fill in as many of the twenty-five blanks on the Playcard as possible in a five minute period with words or phrases that fit the selected class and category. The unique scoring system distinguishes between the general and the special abilities of the players and allows for winners in each of three classifications. Special rules permit children to compete with adults. 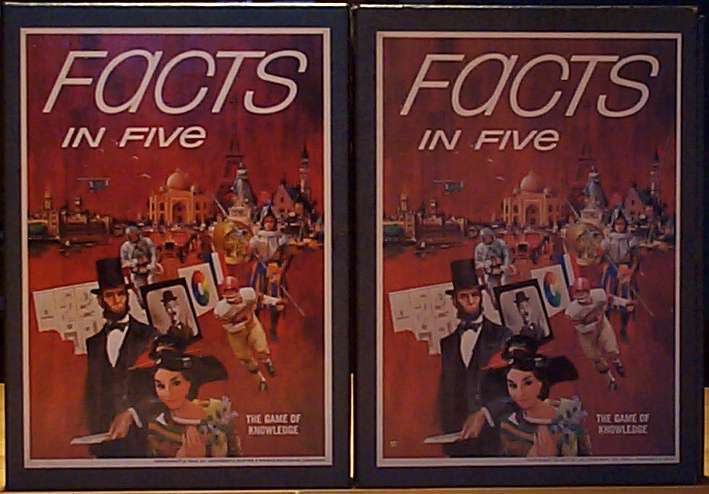 Facts In Five is an entertaining family game for one to six players. Average playing time per five-round game: 1 hour. Handsome bookshelf case contains Class Cards, letter tiles, erasable Playcards and Master Score Card, special marking pencils and complete instruction. - Die Farbe des Schubers ist grau; der Inneneinsatz ist aus schwarzem Plastik - und nicht marmorisiert, wie die späteren Ausgaben.